Irish Water have decided to go to a hardline approach and are pulling the TRUMP (no pun intended) card. 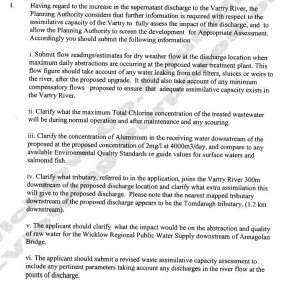 “People before Fish” and saying “The storage at the Vartry has a limit and if additional water is provided in compensatory flows, it will have an impact on Irish Water’s ability to provide sustainable drinking water supply for the region.” The propose to give 1/3 of the current amount of water that is currently coming from the Roundwood Treatment Works. This is will amount to the death of the River Vartry. 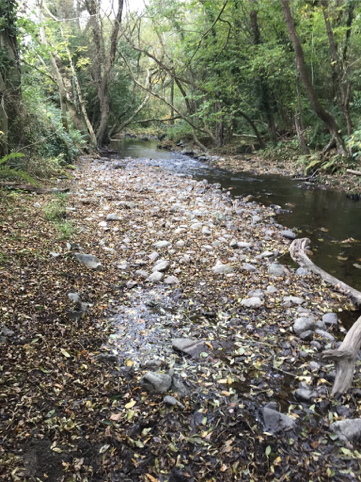 If you are in any doubt about our claim, here are some pictures of the state of the river as it is now in early November. Try to imagine 1/3 of this amount of water over the Weir. Here is the width of the river going towards Ashford. The stones should not be visible. If you want to make your voice heard, you can support our Objection by writing to the Wicklow Planning Office, Wicklow County Council, Wicklow Town. 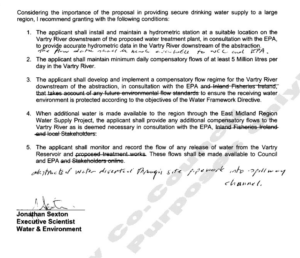 Place at the top “In support of River Vartry Protection Society’s Submission on 16363”. Tell them directly what you think. We can see that Irish Water have no concern for the Environment and have no intention of preserving the status-quo of the river. It is soon going to be time for a bigger and wider campaign if we are to save the River Vartry from their grasp. We will be doing some “crowd sourcing” for funding in the event we are going to have greater need for experts and legal cost, but for the moment we are following the path and waiting for Wicklow County Council to make a decision by the end of the month on this planning. We were in negotiation with Irish Water but they decided to suspend negotiations and have a try first if they could get a decision from the Wicklow County Council. They turned in an answer to the Further Information Request with the original abstraction figures of 5ML per day against the currently released 15 ML per day. This would give the River Vartry 1/3 the amount of water in dry weather than we currently have. Anyone seeing the level of the river at the moment, would realise that there will be no fish left after this. With the fish gone, the otters are gone, the badgers are gone, the deer are gone, the herons are gone, the bats are gone, the whole ecosystem is gone, eventually destroying the Murrough. This is not imagination or scare mongering, but will be the reality if this is not fought through the planning system and the courts. Everything on the Vartry System is connected. When the microorganisms are harmed, the invertebrate and small organisms that the fish feed on, disappear. A cascading effect on all of the wildlife results. According to the data given to us by Irish Water, the River has had 15 ML per day released all year round since 2007. We pointed out that since 2007 the status of the fish as measured by the Irish Fisheries has gone from poor to high quality, as it is now. The fish have adapted to the current regime and are thriving. It is not great when the water is so bad as it is now, but we believe even stressed by lack of oxygen, the fish will survive. Take away 2/3 of the water and they will not! 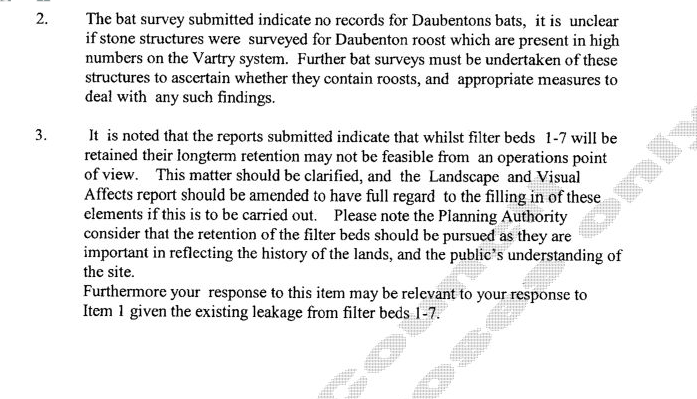 Irish Water points out that these are leaks since 2007 and they do not intend release this need to fix it. We say, we do not want this reduced and they do not have the right to destroy the river. The Wicklow County Council have again asked for Further Information Clarification on this from Irish Water, supporting our claims. 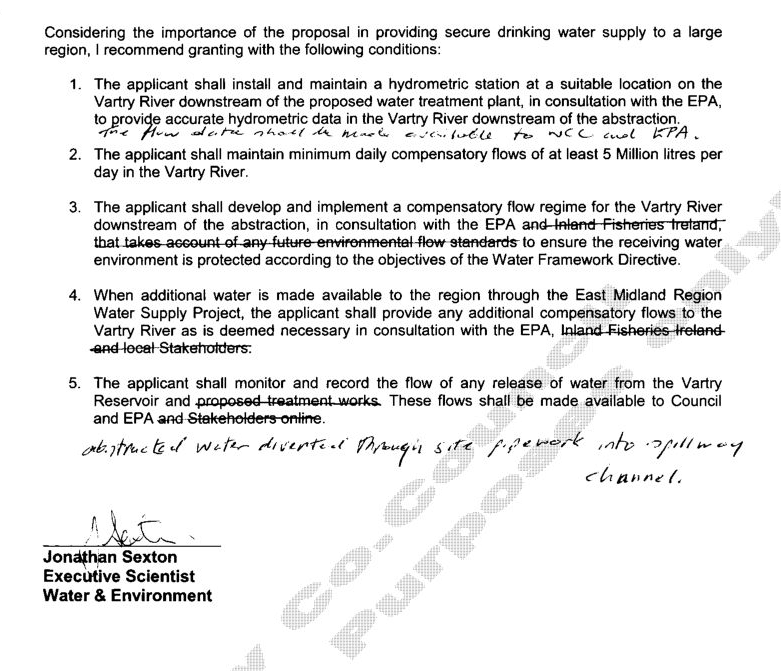 Irish Fisheries and An Taisce have come down strongly against Irish Water’s submission as well. We know however that one should not get too enthusiast about this. We have seen in the past that the Planners often just ask and then regardless of the response, grant permission. If that is the case, we will be in An Bord Pleanala arguing our case for the survival of the River Vartry. We would like to hear from you and make your voice heard. Join us and add your comment. The Latest news on the Roundwood Treatment Works Upgrade is that it is on hold until Irish Water answer the Further Information Request by the Wicklow County Council. The Planning Application is on Hold and they have 6 months to answer. We would like to thank the Wicklow County Council for supporting us in many of our Objections and adding a few of their own. They did not take up the issue of an Independent Environmental Impact Assessment but a decision that this is necessary might come after they receive the answer from Irish Water. 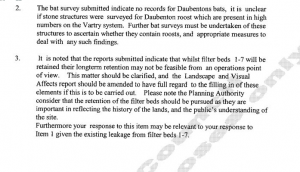 They have shown their concern for lack of clarity in the application on Pollution and Abstraction, so could easily conclude that Irish Water are unable to give a proper assessment of the risks involved, as we believe. We will continue our efforts to make sure that this Upgrade does not happen as it is planned and that the changes required and made before any digger starts and mud flows in the Vartry River. 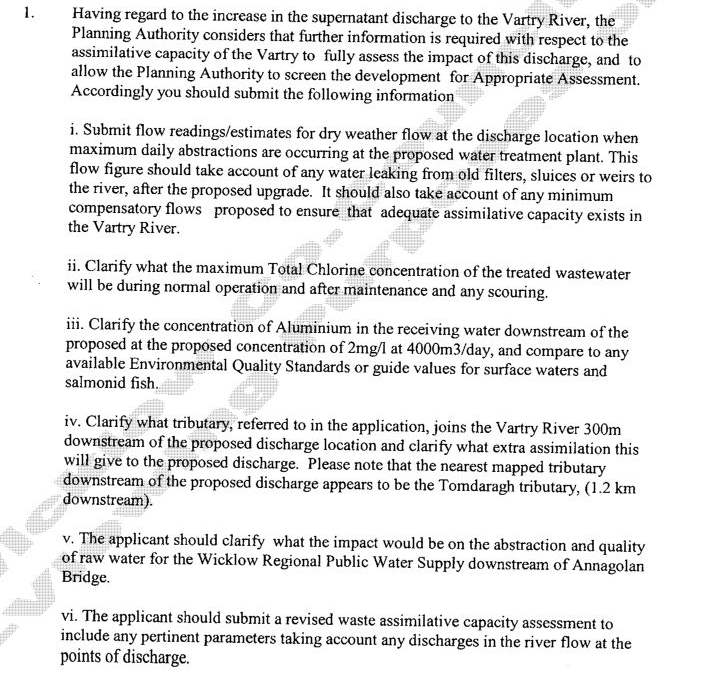 I have attached the WCC Further Information request below for some interesting reading which illustrates why we are so concerned ourselves and insist that Irish Water must do an EIA. A local person who has lived in the area for about 20 years brought up some more issues which we could consider as part of the river preservation. 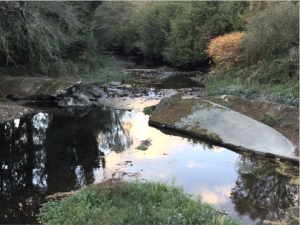 He feels that the river level is more related to Wicklow CoCo taking water via pipes in the dryer summer months, as opposed to the reservoir – he believes that the water level in summer is impacted mostly by this. Removal of trees from watercourse – last time this was done after the storms, when it was too late. There’s a good chance this will happen again. There’s a lot of heavy timber in the water around Devils Glen. This is something we could easily sort out, and we could arrange a work party to remove this. Removal of trees from river banks needs to be managed as it impacts on otters. Mink population wipes out the fish, and they need to be trapped. There’s definitely mink in Devils Glen, but not sure of overall population on river. When mink are removed, the otters move back in. Conifers planted too close to watercourse drop leaves and that makes the water too acidic.